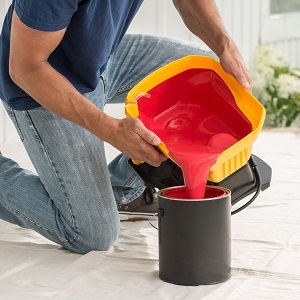 The new Control Pro 130 Power Tank is ideal for big interior and exterior jobs and can be used with a wide range of unthinned paints and stains. It takes the intimidation out of airless spraying with fast and easy set up and unmatched control, all while delivering continuous painting and fast coverage. 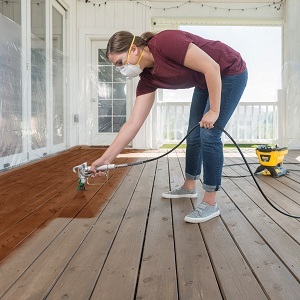 The Control Pro 130 is perfect for painting the exterior of your home, staining a large deck, and more. It is gravity fed for fast, no mess priming and cleaning. 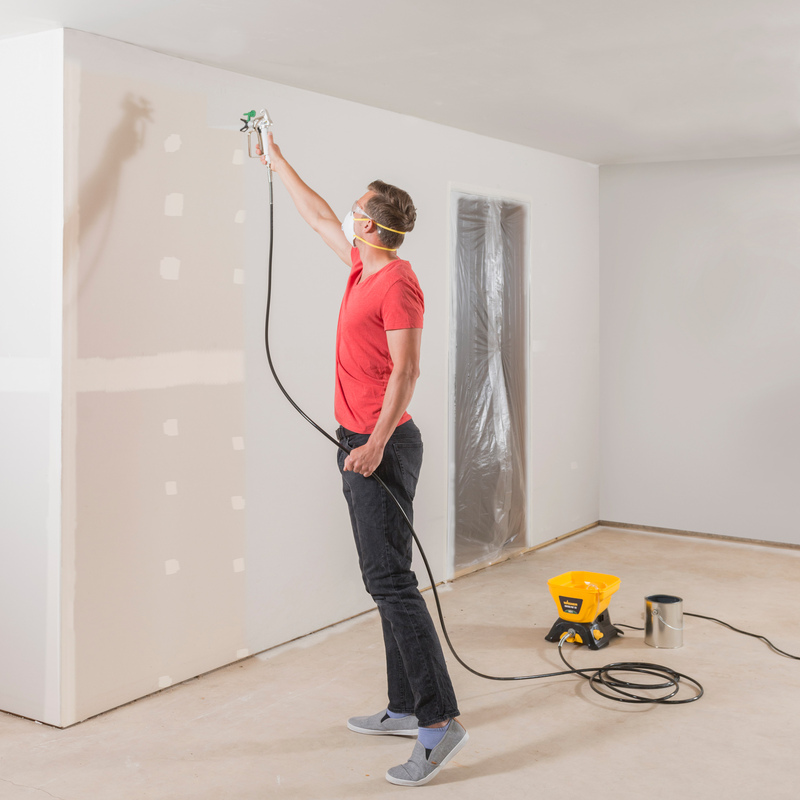 The spray gun also features High Efficiency Airless technology that creates soft fan pattern edges so you can achieve a smooth, consistent finish without splatter or gaps. 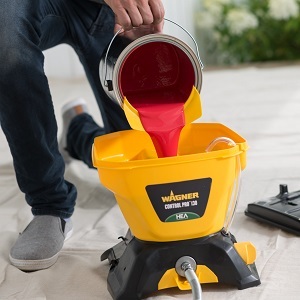 This Wagner airless paint sprayer produces up to 55% less overspray than traditional airless sprayers which means easier preparation, quick clean up, and less paint or stain used. Control Pro 130 Sprayer is rated 4.8 out of 5 by 70. Rated 5 out of 5 by Ed2317 from Great features, well made My Wagner control pro 130 sprayer, is easy to use right out of the box. Worked very well with very little over spray. Just prime correctly and use a practice board first, so you can get a feel of the sprayer, then just paint away. Rated 5 out of 5 by Rguadarr49 from Light weight and easy to use I received the Control Pro 130 about a month ago, sorry it took me so long to write my review, bad weather. I have a split level home and I painted the concrete walls of the exterior. I bought concrete paint to use. After I masked off part of the siding of the house and surrounding area, the Pro 130 was easy to use, the spray fan was perfect, I really like the 25 ft. long hose, I just left the tank in one place and I was able to do one side without moving tank. 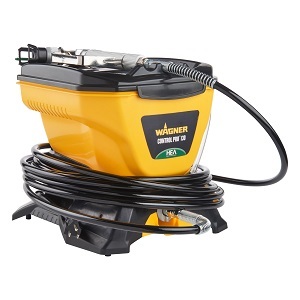 I have a Wagner Flexio 590 Airless and I prefer the Pro 130. Clean up was easy just make sure all the paint is out of the hose. Thank You Wagner for another great product. Rated 5 out of 5 by Preston_jb from A Great Tool Thank goodness for the Wagner Control Pro 130 Sprayer. Been working on some project behind my house and needed to paint after the work was completed and the Wagner made the job quick and easy and with the control sprayer, I was able to spay and not lose a lot of paint on the ground and was able to horn in on the specific area that I need to paint without having to do much masking at all. With the Wagner, you control were you want the paint to go. Clean up was really. Pour the unused paint back in the can and a water hose takes care of the rest. I like it that Wagner supplies you with the brushes, etc. for doing the fine cleanup on the sprayer. Go out and get one and you will be happy you did. Rated 4 out of 5 by LoganK from Nice quality and performance I got this sprayer because it features less overspray, which is the main issue I have faced with all paint sprayers. You will have some amount because of how they work, but any reduction you can get helps. I like the size of this sprayer and the ability to store all of the parts inside of it when done. 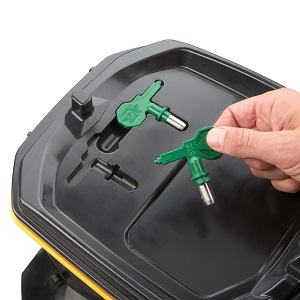 On other sprayers I have had to store the hose wrapped around the unit and this one has the internal capacity to have the hose and sprayer stored inside which makes it easier. The quality of the spray handle is also very nice and has a solid feel to it. The spray tip operates very smoothly and can be swapped for different types easily. Overall the use and maintenance is very similar to other sprayers and you have to make sure you clean it properly. 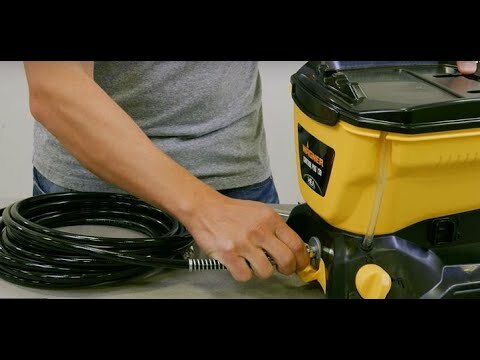 The only reason I did not give it 5 stars is because of having to pour paint out of the paint can and into this sprayers bucket is a little extra work than other sprayers where the can is your paint supply. Transferring the paint back and forth if you don’t use it all can be time consuming and you lose a little paint in the process. It would be nice if there was a way to have some temporary liners to use or maybe an adapter that would let me pull directly from the paint can for times where I want to quickly paint something without having to clean the entire unit. That may just come down to the type of use though and using this on a larger paint job that would not be as much of a factor. Overall a very high quality product and does what it says. I look forward to using it more now that the weather is getting nicer and I can get to more projects. Rated 5 out of 5 by DrBill from Well Worth the money Living near the Canadian Border, I had to wait till the temps rose. The Magic day arrived, 60 and rising! My project was my garage door, prepped last fall but not painted. Taped the door and dropped clothed the asphalt. Unpacked the unit. Very clear instructions to assemble. I always test spray with water, I had no problems. Loaded the unit with paint and adjusted the spray on a piece of cardboard. Spraying the door took only MINUTES!. Easy to clean, The door looks Brand New. 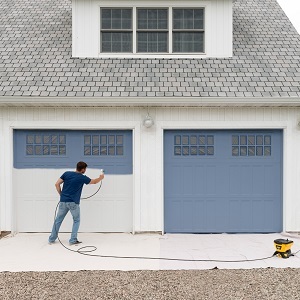 This is the perfect sprayer for any homeowner that has maintenance painting on a regular basis. Unit is easy to use and to clean up! Rated 5 out of 5 by Greg2017 from Versatile airless paint sprayer. I received this versatile airless paint sprayer a little over a month ago. The box had everything I needed for the two projects that I had already planned to use it on. The instructions were very clear and concise covering all the parts, setup, spraying, clean up and storage. I followed the loading instructions in preparing to use the sprayer. I set up a practice are with plastic drop cloths and several large sheets of cardboard from a refrigerator box. Following the instruction in the owner’s manual I did a series of practice sprays to get the work and feel of the spray gun using some extra paint from a gallon. There was very little overspray, a great feature, while I did my practicing. Once I completed by practice sprays, I followed the cleanup instructions to clean the gun, hose and the tanks. The instructions worked fine and I wouldn’t make any changes. My first project was paint three complete doors and frames that I was replacing in my house. After setting up the area in my garage I loaded the sprayer tank with a nice semi-gloss paint. I sprayed the frames first. The coverage was great with very little overspray. I next sprayed the six panel doors. The coverage was smooth and much better than the doors I had done with a roller and brush. I followed the short-term storage process so that I could give the doors the three coats that I planned. The doors looked great when I had finished. Clean up as really easy. My second project was painting my son’s bedroom. After taping off the windows, doors, outlets, switches and floor I was ready to begin. I loaded the sprayer tank with a light blue eggshell latex paint. I sprayed wall by wall from top to bottom. I didn’t see much overspray with great coverage. I followed the short-term storage process to wait about 12 hours while the first coat dried. Startup from storage was easy and the second coat went on just great. My son was impressed with how well the paint was sprayed and covered. There was very little cleanup in his room. I followed the cleanup instruction and the sprayer was ready for my next project. 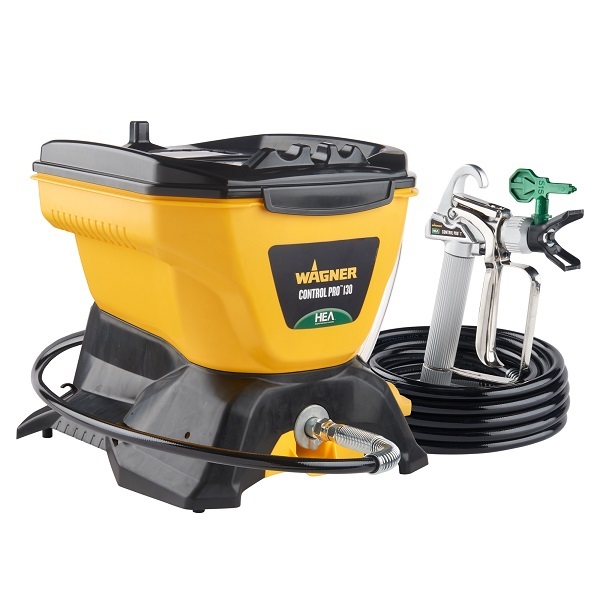 I would recommend this sprayer to my friends because it is easy to set up, has a job sized tank, experienced no problems and had little overspray for the projects I completed. Cleanup is quick and efficient too. Rated 5 out of 5 by Skinny from very easy to use, gre4at features had to wait till weather warmed up use ,but when i was able to use it ,it great , i was pleased with the 25 foot hose that gives you freedom to move around and spray at any angle ,and capacity is great feature. over a fine tool. Rated 5 out of 5 by Johnny B from Wagner Pro 130 sprayer After several weeks of bad spring weather it was time to paint in Pittsburgh. I had the advantage of going thru the instruction booklet and equipment for weeks before I could paint. Setup was quick and straight forward , spent a little time on cardboard getting a feel for what the gun control was. The pattern was nice with no problems on this project , latex paint came out without any splatter or messes , No thinning of the paint was needed and cleanup was ok I will try my hand at a little stain work of some trim during the Easter weekend. This is the second time we have used it and it is leaking from somewhere underneath the main body and is coming out below where the hose connects to the main body. It does not require it, but it will accept a filter. Any problems with using a paint + primer product like SW Weathershield. As long as you have the right tip to match the paint, you're good to go! I plan to paint furniture, not large areas. 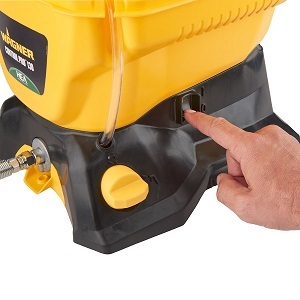 What is the minimum quantity of paint required to operate this sprayer? 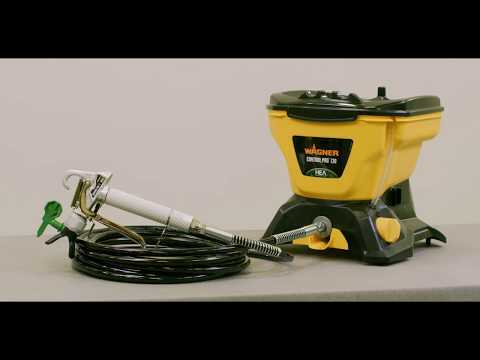 We have much more efficient HVLP sprayers for furniture projects. But if you're using the HEA, I wouldn't load less than 1/2 gallon at a time. To discuss your options give us a call at 1-800-328-8251. Will this work with a HEA airless roller? The Control Pro 130 will work with a HEA airless roller. Please give us a call at 1-800-328-8251 and we will able to assist you. Will it spray roll on bedliner paint? ?